Both of my daughters enjoy sewing. I enjoy watching the care they take with each new thing they make. My youngest daughter has been working on this quilt. She has ripped out seams and re-sewn pieces to make it all line up just right. Isn't it encouraging to know no matter how much we mess up, God has a beautiful plan for our life! I think I've felt God's seam ripper working on me from time to time. Then He mends me together again. And that alright with me. Beautiful thoughts today! Thank you & Happy Mother's Day! 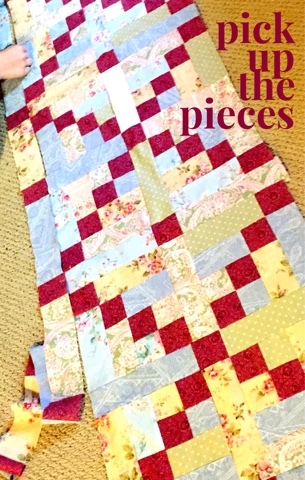 Love the comparison of your daughter, her quilt, and God's plan coming together even though with we humans, he has to continually start over at times because we want to make it our pattern instead of his perfect one. Happy Sunday and Mother's Day. What a beautiful quilt! God bless you on this Mother's Day! What a lovely quilt! And I love the reminder that God can put our pieces back together too. Happy Mother's Day!